A small group of enthusiastic gardeners got together in 1989, and decided to make the suburb of Adamstown a little greener. The act of propagating and planting trees was greater than the sum of its parts – and Trees In Newcastle was formed. We have since collected seed, propagated and planted thousands (and thousands) of local, native species. This could not have been possible without our members and supporters. We are now a proud community organisation, working throughout the Hunter region and with locals wherever we go. By becoming a member of Trees In Newcastle, you have the opportunity to help shape our future. 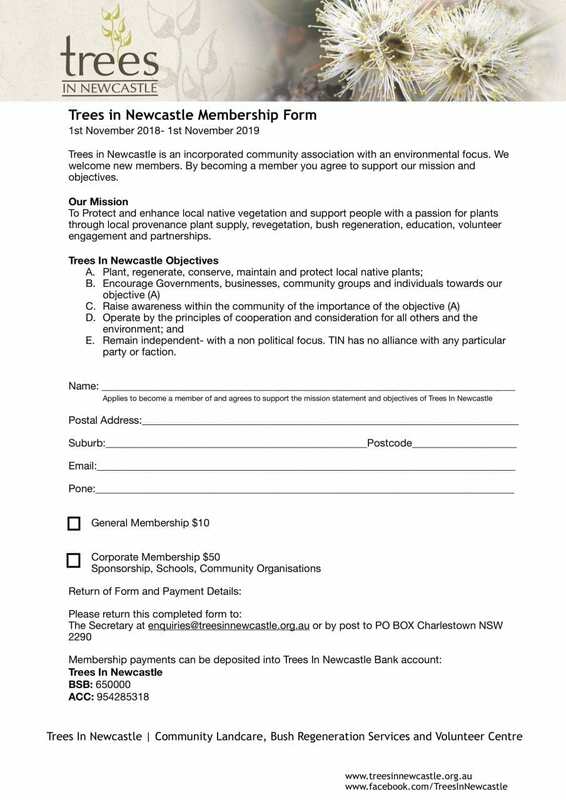 We may have begun by planting in a Newcastle suburb, but where we end up will be influenced by our members. Inform the future of Trees In Newcastle. Join the Board or be involved in forums and Annual General Meetings. To be a successful Board, we need people with skills in community engagement, fundraising, finance and account keeping, marketing, law, grant writing, building, electrical, plumbing – you name it, we need it! Participate in workshops and hands-on activities including seed collection, plant propagation, tree planting and community education projects. Receive our e-newsletter full of information, updates and tips. Access free information and advice on growing native plants and selecting the appropriate species for your site.